By staff writer Vicki Lathom. Photos Copyright © Vicki Lathom. What the woman sitting next to me at Pete’s Pub meant was that the anarchist would feel at home in a place seemingly freer of rules than the world outside, in a simpler, nonconformist little society not influenced by technology. 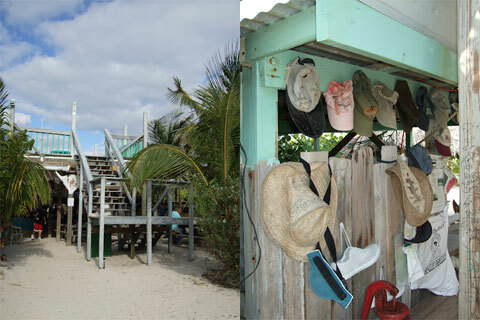 Pete’s Pub, a popular watering hole on the beach in Little Harbour, Abaco (see map for Abaco Island in the Bahamas), is a microcosm of the bohemian settlement remotely located off the main highway down Great Abaco. Little Harbour is off the grid. In a serious attempt to be self-sufficient, residents use cisterns for collecting water and solar power, backed up by propane generators. It’s a friendly outpost, a true child of its founder, sculptor Randolph Johnston, who left his teaching job at Smith College in Massachusetts for a simpler life. Johnston sailed here in 1951 on his schooner Langosta to get away from the “life of machines” and live in more freedom from society’s rules. When he arrived, there was nothing in Little Harbour, just a nice round bay surrounded by sand. And caves, one of which it is said he lived in with his wife, Margo, where they raised four children. He found the freedom he needed and became successful as an international artist. Johnston died in 1992 and his son Pete took over the gallery, creating the pub out of the old pilot house of the Langosta. 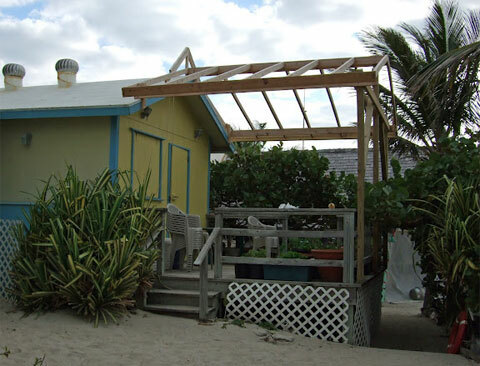 Today, the pilot house remains the core of the building, a disheveled beach bar that resembles a rambling tree house made of driftwood and designed by a hurricane. The grounds include Johnston’s foundry and sculptures exhibited in a beachfront studio. Reflecting the arty and intriguing personal character of Johnston, Pete’s Pub has sand floors and the bar is open to the elements, with hundreds of T-shirts of past visitors nailed to the inside of the roof. Customers sit on beach chairs and at picnic tables. 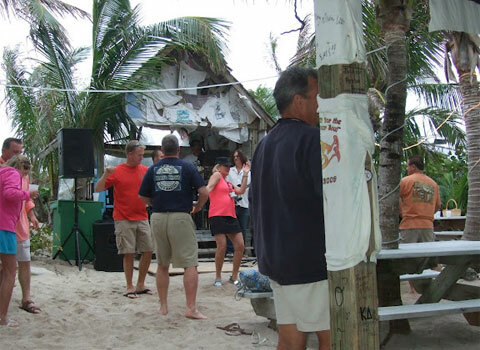 Our visit was the celebration of Pete’s Pub’s 11th Annual 50th Birthday Party, the go-to event for the Abacos each year. (The event name is an offbeat take on the 61st anniversary of Johnston’s landing at Little Harbour.) A band played non-stop and couples who obviously didn’t come together danced in the sand holding their drinks. The food was surprisingly good for a rustic tiki-hut restaurant: fresh grouper and roasted pork, local fare. I sat with a retired high school teacher from Kentucky who was wearing a bandana and one earring. He spoke of 5,000 garlic plants back home as well as some unusual vegetables which he sells to local restaurants. A handsome 40-something man with an earring and fashionably-spiked hair carried his tiny mixed breed poodle-like dog, who seemed perfectly content with his four feet up to the sky. I was prepared to be put off by Pete’s Pub, by a pretentious shabby chic. Despite my cynicism, I was seduced by the easiness of it. Every inch of this bar has been etched by visitors looking for a laid-back retreat, far away from a highly organized world. I’m sure that, somewhere, Professor Randolph Johnston is looking down, pleased with what he has accomplished: a living gallery of his art and a warm and personal gathering place designed by nature. Vicki Lathom has been a writer and sailor for forty years. She retired from being director of public information for Montgomery County, Md., in 1996, and went to work for Maryland Governor William Donald Schaefer as his speechwriter. 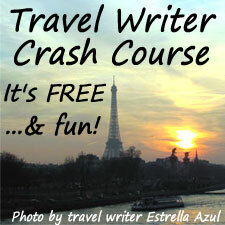 Vicki has also done freelance travel writing and photography for such publications as SAIL and Maryland Magazine. 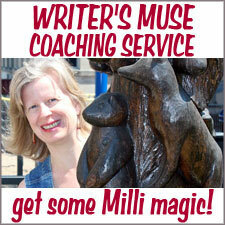 She is currently a writing instructor for two graduate schools at the University of Maryland. This sounds like fun, Vicki! I love how you captured my exact feelings of the place judging just from your words and the photos – how it’s a place for visitors looking for a laid-back retreat, far away from a highly organized world. What an amazing place. Thanks for sharing Vicki! Well ya cant get more laid back then that! What a lovely place, and great descriptive writing! 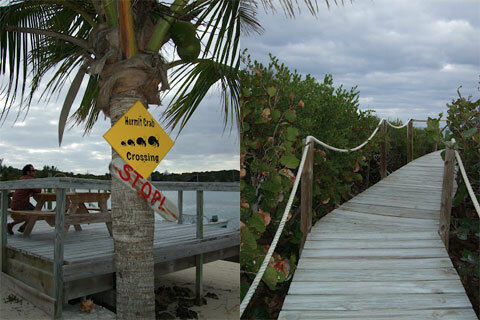 This sounds like the perfect place to “Get away” and have fun doing it.